Nero's CD Speed burn tests a DVD+RW rated to 2.4-4x. The disc was burned files of about 4.7GB in size. This test is done by simply placing blank recording media into the burner and running CD Speed the software will detect if it is DVD-RAM, DVD-/+R or DVD-/+RW media and run the appropriate tests. Like we saw when burning CD media, the AOpen DRW8800 burns the DVD+RW disc faster than it's rated to! DVD burners are no longer a luxury item and now consumers have an affordable option at hand for digitally recording their old videotape home movies. In fact, if you like more information on how to do just that, please see PCstats Guide to Video Capture. With a retail price of $128 CDN ($97 US), the AOpen DRW8800 8X DVD Recorder is competitively priced and offers potential consumers a whole host of possible uses. Whether you need to store or transfer a bit of data on a standard 700MB CD, or a massive amount of information on a 4.7GB DVD disc, the Aopen DRW8800 should be ready to serve. 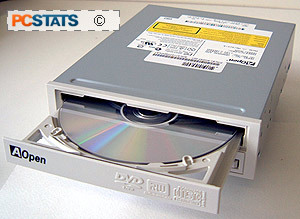 That flexibility cannot be beat by any other storage system out there, and considering the market penetration of the DVD-ROM, you have a disc that can potentially be read in millions of computers! Ultimately, we were quite pleased to discover AOpen had bundled in such a complete package of entry-level software with this 8X DVD burner. After all, don't you just hate it when you buy a new bit of hardware, only to find out the software you need to run it has to be purchased separately!? Bottom line, the AOpen DRW8800 is a good 8X DVD burner that comes with a helpful package of software to get you moving in the right direction should you wish to transfer those old videotape home movies onto recordable DVD media.